Today I'm excited to have my friend Aimee guest posting for me! I am constantly amazed at the awesome things Aimee finds when she is thrifting, so I asked her to share a couple of her tips for finding great pieces. Tomorrow she'll be sharing some of the things she's found and transformed, too. So here's part 1 of her mini thrifting series! Hi! My name is Aimee and I am really excited to be guest posting for my wonderful friend and fellow blogger, Sherri! I love a good bargain and therefore love to frequent thrift stores, so when Sherri asked me to do a guest post about thrifting I immediately said "yes!" This will be the first of two posts, with some of my tips and hints to help you have the most successful thrifting experiences possible, so let's get started! 1. Shop often - Thrift stores put new merchandise out daily, so the more often you go, the better your chances are of finding some great items. Think of it this way, if you knew Target put out new merchandise every day, wouldn't you shop there more often? Probably so. So try to get into the routine of stopping by the thrift store on a pretty regular basis. There's a Goodwill near the Wal Mart I usually go to, so whenever I'm not in a big rush I automatically stop in. And that's another little tip, don't thrift shop when you're pressed for time. Either you'll breeze by and overlook something, or you'll get caught up in the search and be late. 2. Shop timely - I think there are two times that provide more treasures, as I often call thrift store finds. The first are those few weeks in between the seasons. As people pack away all of their summer items they'll get rid of what they never used, or after Christmas people will often donate a lot of things because they've recently gotten new things. When an abundance of new items come in, where does it go? The shelves! The other time is Tuesday and Wednesdays. Many people will clean over the weekend, and then donate their unwanted items, so by Tuesday and Wednesday the new stuff it out. This is especially true in the summer, after people have leftover items from their yard sales. 3. Shop around - When you hear thrift store, what comes to mind? Goodwill most likely. But many cities have other thrift stores besides Goodwill. Lots of charities and non-profit organizations run thrift stores as a source of additional income. So get online, search around, and see what stores you've been missing out on! 4. Shop inspired - Unless you're a big fan of outdated early-90's home decor, you're not going to leave a thrift store with lots of cute items that you love. But if shop with an open, creative mind, you'll leave with lots of potential. That's why looking at blogs, and sites like Pinterest can be really helpful. Remember, anything can looking amazing with a fresh coat of paint and some new hardware! And that is why you need to come back tomorrow. In my next post I'll show you some boring/average items I've found, and how I've turned them into something really cute. Every room in my apartment has thrift stores treasures in it! In the meantime, you can check out my blog: A Tale of Two Feet. Great tips! I always love a good deal. Oh I love these tips. I've always found thrifting to be overwhelming...but these are great ideas to help make it an easier process. I always love to hear other people's tips on thrift shopping! I couldn't agree more about having an open mind. 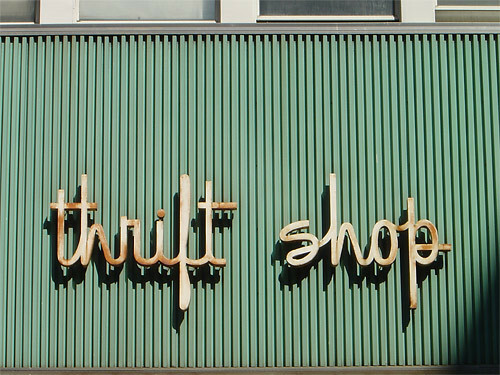 These are great tips for thrift shopping! I didn't think about some of these tips that she shared. I love thrift shopping though!